The assessment by the Congressional Budget Office also says premiums could become unaffordable for people with pre-existing conditions. WASHINGTON — The health care bill that Republicans have pushed through the House would leave 23 million more Americans without insurance and confront people with costly medical conditions with coverage that could prove unaffordable, Congress’ nonpartisan budget analysts said Wednesday. Premiums on average would be lower than under the Affordable Care Act — a chief goal of many Republicans — but that would happen in part because policies would typically provide fewer benefits, says the report by the Congressional Budget Office. 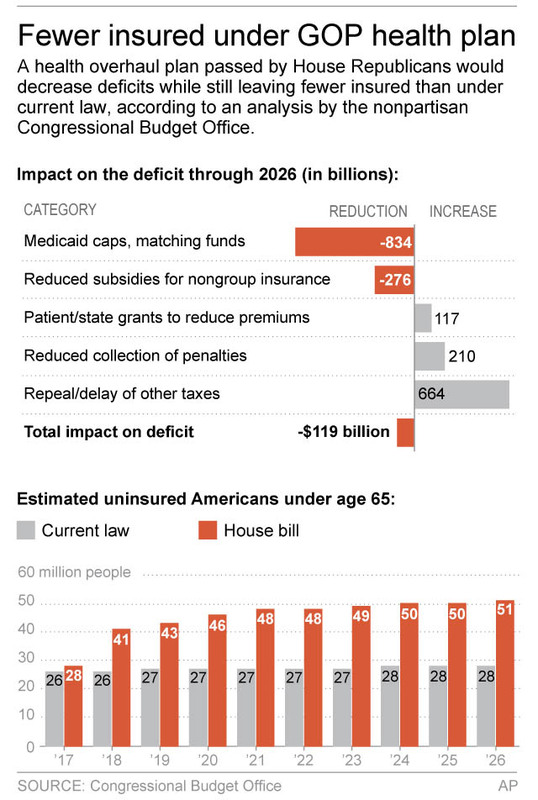 Congressional Budget Office estimates of uninsured Americans and deficit reduction under House Republicans' health care bill. In some regions, people with pre-existing medical conditions and others who were seriously ill “would ultimately be unable to purchase” robust coverage at premiums comparable to today’s prices, “if they could purchase at all,” the report says. That was a knock on 11th-hour changes Republicans made in the bill to gain conservatives’ votes by letting states get waivers to boost premiums on the ill and reduce coverage requirements. The report says older people with lower income would disproportionately lose coverage. Over half of those becoming uninsured, 14 million people, would come from the bill’s $834 billion in cuts to Medicaid, which provides health coverage to poor and disabled people, over 10 years. Democrats cited the analysis as further evidence that the effort to repeal the ACA – a staple of Donald Trump’s presidential campaign and those of numerous Republican congressional candidates for years – would be destructive. It comes three weeks after the House narrowly passed the legislation with only Republican votes, and serves as a starting point for Senate Republicans to craft their own version, which they say will be different. Trump’s health and human Services secretary, Tom Price, assailed the CBO for being inaccurate, with the White House issuing a similar critique. Trump and Republicans celebrated the House’s narrow May 4 passage of the bill in a Rose Garden ceremony after several embarrassing setbacks, even as Republican senators signaled it had little chance of becoming law without significant changes. In a late compromise, House Republican conservatives and moderates struck a deal that would let states get federal waivers to permit insurers to charge higher premiums to some people in poor health, and to ignore the standard set of benefits required by Obama’s statute. The CBO said states adopting those waivers could destabilize coverage for people with medical problems. The agency estimated that one-sixth of the population — more than 50 million people — live in states that would make substantial changes under the waivers. The budget office projected that premiums in those states would be lower for healthy people than under current law because their coverage would be narrower, but it did not estimate an amount. In those states, “it would become more difficult” for seriously ill people to buy insurance “because their premiums would continue to increase rapidly,” the report says. In states not getting waivers, where an estimated half of Americans live, average premiums would be about 4 percent lower in 2026, the report says. For the one-third of the nation where states would modestly reduce coverage requirements, average premiums would be about 20 percent lower, the analysts estimated. The report said that under the ACA, the nation’s health insurance market is expected to remain “stable in most areas” because federal subsidies to millions of consumers largely rise with premiums. Citing markets where insurers have left or sought huge premium increases, Republicans have repeatedly said the statute must be dismantled because it is in a death spiral. Without naming the Trump administration, the report says factors encouraging insurers to flee some markets include lack of profits and “substantial uncertainty” about federal actions. Trump has suggested the IRS won’t enforce penalties against people who don’t buy coverage, as Obama’s individual mandate requires. He has also left uncertain whether the government will continue payments to insurers that let them lower out-of-pocket costs like copayments and deductibles — reductions they are legally required to make. Republican Sen. Susan Collins of Maine, who has proposed an alternative health care bill along with Sen. Bill Cassidy of Louisiana, issued a statement Wednesday night urging senators to support that plan.